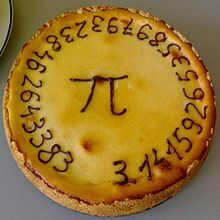 Pi Day or Pie Approximation Day is a day when people around the world celebrate the number pi. They also eat pie to celebrate the pun as both words sound the same. Pi Day is held on March 14. On Pi Day 2004, Daniel Tammet recited 22,514 decimal digits of π. This page was last changed on 3 March 2014, at 01:27.